(Newser) – CNN says its New York offices and studios have been given the all-clear after a bomb threat was phoned in Thursday night. 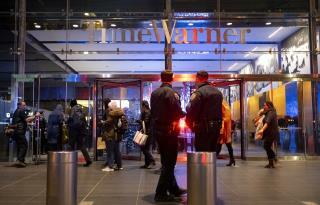 The threat at Manhattan's Time Warner Center forced the evacuation of the facility and the closure of part of West 58th Street to vehicle and pedestrian traffic, the New York Post reports. Police say a man with a southern accent called CNN at around 10pm and said five bombs had been placed in the building, reports the AP. Fire alarm bells rang in the newsroom and Don Lemon's CNN Tonight, which had been on a commercial break, ceased broadcasting as the network switched to taped programming. I heard that Fox News mentioned that this was just Fake News and Trump responded with a thumbs up emoji.